The house and mill sit on a site of some 6 acres,of which about an acre is water,served by two streams that flow from Blackdown,converging close by to form the source of the river Wey. The first known record of milling activity on the site dates back to 1357 when the then owner was fined for diverting a watercourse.There are many references to water extraction and milling during the 16th and 17th centuries. 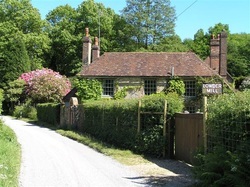 Both the house and mill are now Listed as Buildings of Architectural or Historic Interest.The mill building is mainly 18th century in origin, and is fairly typically constructed, largely of stone with brick quoins. The mill was the furthest upsteam on the river and it is perhaps surprising that the flow was adequate. But the pond was formed at the higher level and drove an overshot wheel, which was positioned on the South side of the mill. The wheel appears to have been removed in the late 1930`s, and none of the mill machinery remains, other than the two mill stones that have found their way into paths in the garden. The house is of more unusual construction and seems to grown over a century or more, perhaps as the prosperity of successive millers improved.The original house was a three bay timber framed building with an inglenook hearth at the side of the end bay, built in the early to mid 17th century. There are 18th century additions, built onto the side of the original structure, and forming three parallel hipped roofs. These newer parts were built mainly of brick, which also provided a cladding over the older part of the building. It is not known precisely when milling ceased, but there is evidence of various activities dating from the late 19th century, including its use as a cooperage.It appears that that the property has been used solely as a residence since the 1920`s when the original garden was probably laid out,including the streams and waterfalls that now dissect it. The basic structure appears to have remained much the same for the last 70 or 80 years or so. That is until Anne and John arrived in 2002. During these years they have completed the refurbishment of the house and a major restoration of the mill.which was in a very dilapidated condition, having been neglected for many years. Its external appearance has not been changed, apart from the addition of the garden lounge, which overlooks the mill pond. Internally, it now provides ancillary accommodation to the main house. As much as possible of the original structure has been maintained, but difficult structural problems, mainly associated with severe water penetration, had to be solved. Most of the garden had been neglected for many years, but with the help of garden designer Bunny Guinness, much of it has been redesigned. The hard landscaping works were completed by 2006. These works included the new pond in front of the mill and the courtyard between the mill and the house. The planting schemes are still very much work in progress. Some, including those around the lake are not yet fully established, having only been planted in the last twelve months or so. Clearing and then planting work still contihues, although you can now walk all the way around the mill lake. The garden, surrounded as it is by water, is hampered by a high water table sitting on dense clay, and the very damp micro-climate in this valley below Blackdown. Improving the drainage continues but it does inhibit some of the planting schemes, which have to accommodate a multitude of drainage pipes and manhole covers. The garden is a haven for wildlife—although it is a battle to keep the deer and foxes out, partial as they are to runner beans. The foxes saunter around in broad day light in the hope of a tasty meal of chicken or duck, and despite the presence of our fox terrier!! Look out for the resident kingfisher, which is often to be seen flying across the mill pond or close to the waterfall to the lower pond by the front of the mill. An interesting and historic property, set in the most glorious of gardens.